Searching for a dependable wholesale supplier is not always an instant process. In business, finding the right supplier is key. Business transactions between a supplier and their clients are a working relationship. One must take on the responsibility of learning the others wants and needs. It’s not just the customers who are always right either. The customer must also understand what their supplier can and cannot do. If these things aren’t established upfront, there will be unfulfilled expectations along with disappointment, lost business, and loss of money. It is safe to assume that neither party wants that. This is why it is important to not assume that just because a supplier is in close proximity, that they will be able to supply you with all of your marble tiling needs at the most affordable rate possible. Marble distributors in New Jersey are fierce competitors. It can be said that their top sellers are the countertops and floor tiling. Even though marble can be incorporated into a build in many other ways, these two items seem to be the driving force for most marble distributors. As this might be convenient for most builders and contractors, it is not uncommon for some New Jersey builders and contractors to look outside their area for marble tile distributors. Some builders may even prefer to keep their marble distributors close by to keep the cost of shipping and handling down. Others are beginning to realize that they don’t have to stay committed to just one marble distributor for all of their stone tile needs. Why Buy Thresholds From Another Distributor? Builders living in the state of New Jersey should consider looking for their marble tile suppliers in the state of Florida when it comes to stocking other marble inventory, specifically thresholds. Stonexchange is a major manufacturer and wholesale distributor of thresholds based in Florida. By offering a beautiful selection of marble thresholds only, Stonexchange can afford to offer buyers the most affordable rate in the market, most likely undercutting the competition in New Jersey. Most stone tile distributors may offer marble thresholds as a supplement to the existing marble order with only a fraction of a discount, if at all. Furthermore, with so many stone distributors in the New Jersey area, many are competing with each other’s prices. Stonexchange is located in Miami, Florida, far from the fray of northeastern stone distributors. It can be said that since New York is reportedly one of the top 10 busiest ports in the United States, an enormous amount of stone tile may be imported there only proving that there is much competition within the New Jersey area. Stonexchange is confident that even with shipment costs, their customers will be quite pleased with their marble threshold inventory. They also make it easy to fill another order making each purchasing experience a pleasant one. 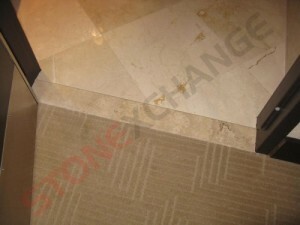 There are three types of marble thresholds that Stonexchange offers. The dimensions are offered in the various sizes: 14” x 2 – 6” x 3/8 -3/4” with a ¼” beveled edge to avoid injury. Standard Double Bevel – The Standard Bevel threshold looks like a thin block of stone that can be installed embedded within the floor for a flush look or on the floor to create a barrier. Single Hollywood Bevel – The Single Hollywood Bevel also referred to as the Handicapped Bevel is a bit larger than the standard making it more wheelchair accessible with a little ramp on one end while the other side looks like the Standard Bevel. Double Hollywood Bevel – The Double Hollywood Bevel provides a ramp on both sides of the threshold leaving a smaller platform, yet making it easier for rolling objects to enter and exit through an entryway. Marble is a type of mineral that comes in a myriad of color variations and veining. Therefore it could be quite difficult for a builder to determine what kind of marble thresholds to stock ahead of time. That is why Stonexchange has arranged to stock only the most popular types of marble in the market. Travertine – A natural porous stone that’s perfect for humid and wet conditions as well as outside climates. This stone comes in the color range of ivory, beige, and rose. Nuevo White Carrara – As slick white marble stone with gray veining offering a high-end finish to any doorway. Crema Sahara Marfil – Somewhat similar to travertine in terms of the shade of coloring, but Crema Sahara Marfil has less white spots and more brownish veining throughout the slab. Black Granite – The boldest type of stone of them all. Its dominant black color strikes a prevalent tone to neutral and ominous spaces. Pure White Thazoz – For the most serene and tranquil approach, this stone offers a clean and heavenly tone of bliss. Bardiglio Gray – For a more masculine tone, this stone provides a regal approach to any professional setting. Emperador Brown – Great for spaces with a warmer theme, this stone will complement the coziest settings. Stonexchange has an abundant supply of marble thresholds as well as other materials in stock and available to ship out upon order without paying the high expense of overseas shipping. As a wholesale distributor, we offer discount prices with bulk orders. View our online catalog for the many different styles you can order. If you’re ready to start a good working relationship with a supplier who can offer you the best affordable rates for marble thresholds, contact Stonexchange today. If you have any questions about and stone building materials, ask us a question online or call us today at 305-731-2400.